Artist Ann Morris spent two decades creating bronze sculptures and other artwork at her 14.5-acre wooded retreat on Lummi Island. Now, Morris is making sure the beautiful enclave known as Sculpture Woods can be a creative retreat for WWU artists, faculty and community members for years to come. Morris and her two children, Brook Morris of Los Angeles and Clea Costa Van Voorhis of Chicago, have given the property to the Western Foundation to preserve as a space for art, performance and education. Sculpture Woods includes a studio and gallery along with 16 of Morris’ own larger-than-life bronze sculptures, which are situated throughout the wooded hillside overlooking the water. Morris continues to work in her studio, where she was recently adding to her “Crossings” series of tiny boats crafted from found materials such as twigs, seaweed, leather, wasp nest paper and wisteria pods. She’ll lease the property from Western as long as she wants to. 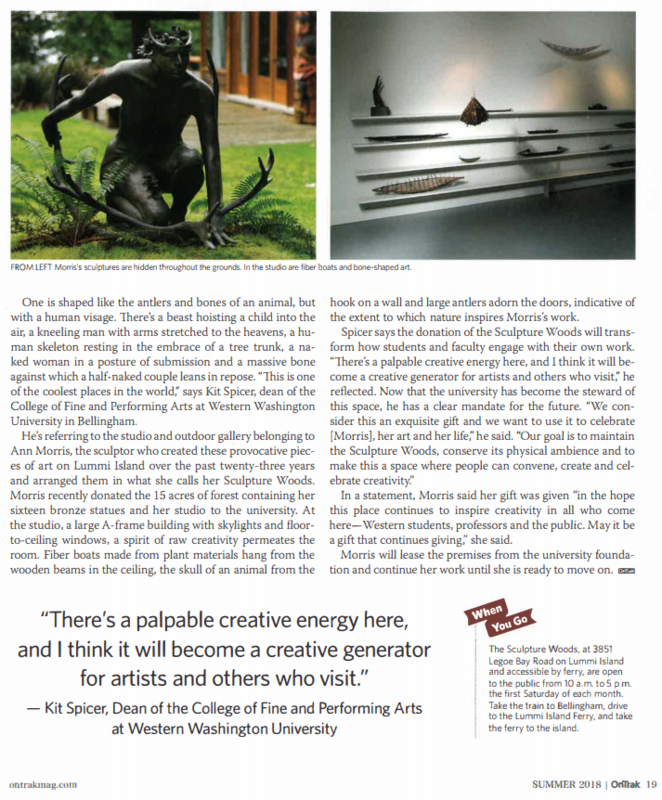 The Western Foundation, which has established an endowment to maintain the property, will preserve Sculpture Woods as a “creative generator,” Spicer says. ​There are many ways Western students and faculty can use the space, he says. Perhaps it could be offered for artist residencies, or as an intimate performance space for student capstone concerts. Art faculty could offer intensive courses in the studio itself. And students could serve as docents on the monthly open house days at Sculpture Woods. A noted artist is providing Western Washington University with a unique gift — a 14.5-acre retreat on Lummi Island that houses her studio and has served as inspiration for 16 large-scale bronze sculptures that populate the property. Known as Sculpture Woods, the forested property is being donated to Western Foundation, which in turn will maintain the artwork and use the property to enrich its fine arts curriculum. "It's one of the coolest places in the world," said Kit Spicer, dean of the College of Fine and Performing Arts at WWU, who has been in talks with Morris for four years on the gift. "Very few universities have anything like this." Spicer said the property could be used to display student work in an on-site gallery, provide a concert venue for student recitals, or attract internationally known artists for short residencies. "The space will be a place to convene, to gather and to celebrate Anne and her art and her life, as well as moving forward to celebrate the creative process," he said. Morris created the bronzes, many of which are primal expressions of human forms, over a decade. In an essay for the Museum of Northwest Art, Morris said "these pieces come from the forested land of mist and rain, where ravens rule and bones wash up on beaches." She will continue to use the studio, built in 1995 overlooking Rosario Strait, but will allow WWU to host events at the property. Western Foundation has created an endowment for the property, thanks to a small group of private donors who have committed nearly $1 million to preserve the collection and its home.